… the most exciting part is that we found out we are moving to California!! In true Navy fashion, we found out Thursday that we have to move TOMORROW. I mean, four days is totally enough time to pack your whole house and try to figure out where to move it to, right? You may not be hearing from me for a few days, so I wanted to share a recipe in the meantime. As soon as I have time, I’ll post a full update! In honor of our last few days in the South, I decided to finally make some grits! Actually, that’s totally a lie. 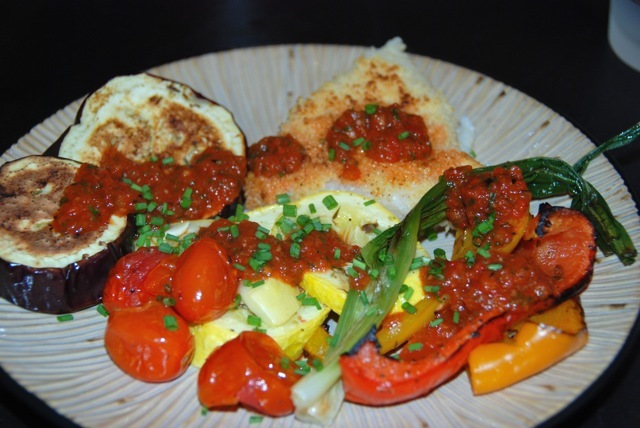 I made this recipe a few years ago and loved it, but the recipe actually called for polenta. Of course, the grocery store here didn’t carry it. After a quick Google search, I determined that the only real difference between polenta and grits is yellow corn vs. white corn, so I figured they’d be interchangeable. Not only did it work, but it was just as delicious as I remembered it! Bring 3 cups water to a boil in a medium pot. Pour in grits, whisking to combine. Reduce heat to medium-low and simmer, stirring frequently, until thick, 3 to 5 minutes. Whisk in 1/3 cup Parmesan and season with cayenne and salt. Coat a 9-inch pie plate with nonstick spray. Transfer the grits to the pie plate, smooth into an even layer and let cool 15 minutes. Preheat broiler. Whisk garlic, oregano, thyme, lemon juice and oil in a bowl. Season with salt and pepper. Toss vegetables with dressing. 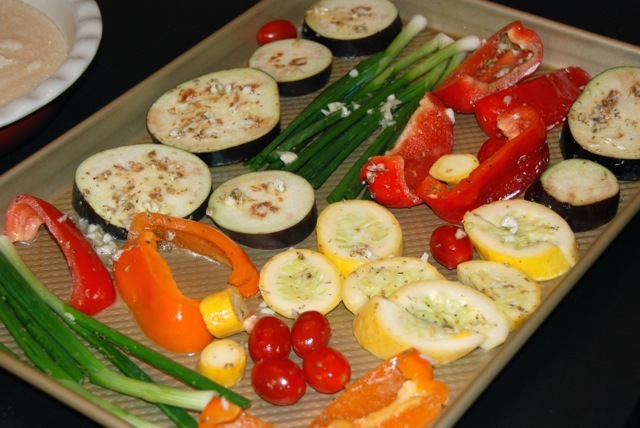 Coat a baking sheet with cooking spray and arrange vegetables in 1 layer. 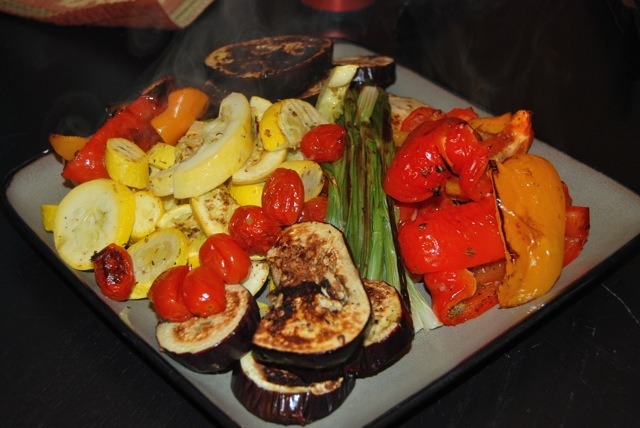 Broil vegetables about 4 inches from heat until tender and slightly charred, 3 to 5 minutes on each side. Meanwhile, combine all sauce ingredients in a blender or food processor and blend until smooth. 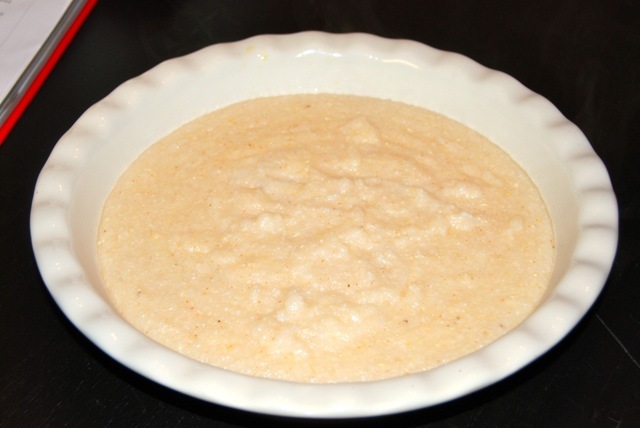 Sprinkle grits with remaining 1/3 cup Parmesan. 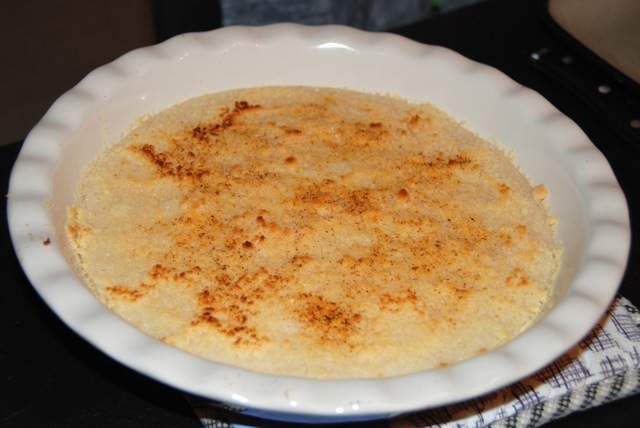 Broil grits in pie plate until golden brown, 2 to 3 minutes. Let cool slightly, then cut into slices. 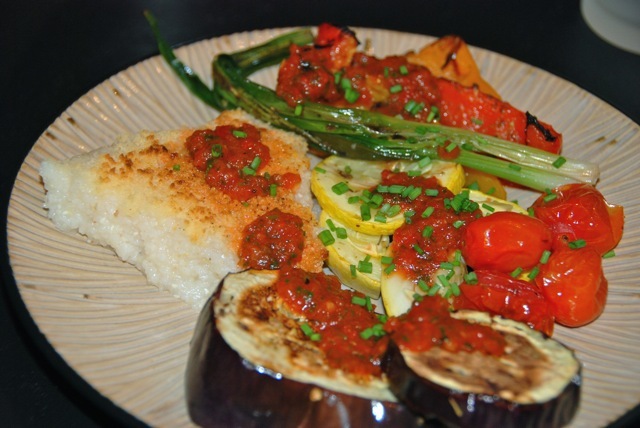 Top grits with vegetables, drizzle with sauce and sprinkle with chives. Enjoy!